Snyder-Young’s book discusses prison theatre quite a bit, and in her larger argument she warns that applied theatre can sometimes reiterate or reinforce the hegemonic structure which it typically seeks to dismantle, or at least brings awareness to. This is especially important in prison performances, where the panopticon-style surroundings makes hegemony more vivid and apparent to all participants. This has been on my mind as I consider what it means to be serious about prison abolition, a position that I have been coming around to over the years, and lean toward more now than I ever have before. volunteer instructor. It gives an interesting, thoughtful perspective on life inside prison, with all of the content and production approved by the warden at San Quentin. It may seem obvious to note that such endeavors can sometime veer into exploitation, as content is produced for gawkers to experience prison vicariously and thank their lucky stars they aren’t incarcerated. 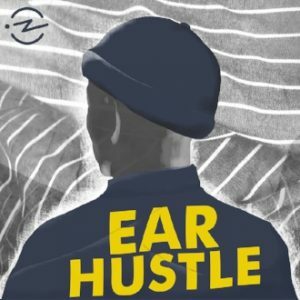 However, Ear Hustle is a sensitively produced podcast, which centers the voice of inmates in a way that never feels cruel or exploitive. Yet, if one is thinking about these issues of hegemony and even prison abolition, would listening to such a podcast run the risk of reinforcing dominant power structures? I don’t really have a satisfactory answer to this right now; I don’t think just because there is a risk of reiterating hegemonic discourse or structure in applied theatre (and I am not sure that Ear Hustle actually falls under this description anyway, because it isn’t a play or a performed piece per se) that it necessarily means one is doing that. But reading Theatre of Good Intentions is really opening up some new ideas and ways of thinking about my work that I hadn’t considered before. This entry was posted in Politics, scholarship, Theatre, Uncategorized and tagged applied theatre, Ear Hustle, podcast, prison, theatre. Bookmark the permalink.